White paper on crime 2004 Part4/Chapter2/Section2/3. 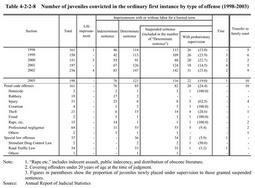 Table 4-2-2-8 shows the disposal of juveniles convicted in the ordinary first instance of criminal courts for the last five years.The table also shows a breakdown by type of offense in2003. In2003,a total of198juveniles were convicted,of which76were sentenced to an indeterminate imprisonment(38.4%),while121received a fixed term sentence(61.1%).Of the121juveniles sentenced to fixed terms,116received a suspended sentence(95.9%).By type of offense,professional negligence had the greatest share(32.3%),followed by Road Traffic Law violations(17.2%),injury(15.7%),theft(10.6%),and robbery(9.6%). Juvenile case: "Juvenile case"is a case in which a juvenile delinquent is treated by a family court. On the other hand,"juvenile criminal case"is:(1)a suspected case in which a juvenile has not been referred to a family court yet,(2)a suspected case referred from a family court to a public prosecutor in which a public prosecution against a juvenile has not been brought to a criminal court,(3)a case after the institution of a public prosecution.